Adding even more ability to customize our towns is one of the reasons why Animal Crossing: New Leaf is so great. This is taken a step further with the customization options added by our friend Cyrus here. 1. Being mayor in town for at least 7 Days. 2. Having cataloged at least 50 pieces of furniture and at least 10 pieces of clothing. 3. Selling at least 100,000 bells worth of product to Re-Tail. Cyrus will wake up and greet you with a very warm welcome (read: threaten you for even looking at his beautiful wife). After your warm welcome he offers you the ability to customize certain pieces of furniture he deems worthy. To customize a piece of furniture, simply bring it with you to Re-Tail and head on over to Cyrus. When you talk with him he will examine what you brought and open up a window for you to select a piece of furniture he's able to customize. There are quite a few options with furniture customization, depending on the piece. Everything I've read online breaks it down into 3 different types of customizations listed as Fixed, Custom, and Gem. Fixed Refurbishing refers to changing the look of an object with the options Cyrus will give you. For example when showing him my modern bed he offered me to color it Red, Blue, Green, Yellow, or Gray for both the Frame and the Sheets. 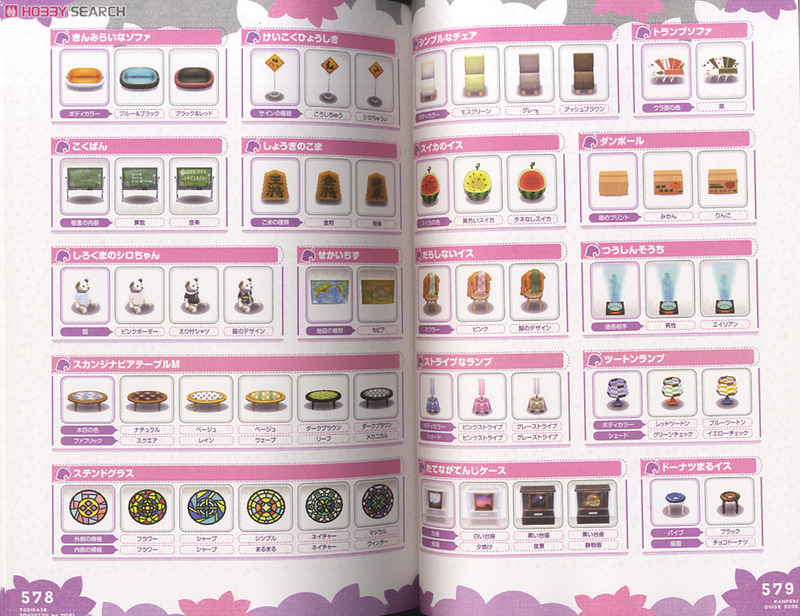 For some examples here is a scan showing some of the types of options on items. Custom Refurbishing refers to adding either a custom pattern, or a clothing pattern to certain aspects of furniture. Going back to the modern bed I used, I was asked if I wanted to use the fixed colors listed above, use a piece of clothing I brought with me, or if I wanted to use a custom pattern I created. Gem Refurbishing is the unique trait tied to only certain specific items. Not all items that can be refurbished get this option. For the modern bed, I was asked by Cyrus if I wanted to use a gem to enhance the look of the frame. To have these options you must bring the gem with you to Re-Tail, he will comment about seeing the gem on you, and says he'll be able to use that. Gems can be used on a select variety of items. Most of the modern set can be changed to any color, while other sets like Lovely will use the gem the same color of the set. Pic courtesy of bidoofcrossing on tumblr. You can also do a few fun things with Cyrus as well. There are recipes to make items like music boxes, as well as using all the pieces of a fossil series to create a miniature to place in your house without taking up half the room. And to finish this post off, a before and after of my Modern Bed. I added an amethyst gem, and chose the grey colored bed spread because they didn't offer purple. The process can take anywhere from a half hour, to a whole day, depending on the type of item you are making. The bed only took a half hour. So that's a "brief" summary of the types of customization Cyrus can do for you.